Second organ: B. c. 1906 W.G Rendall: rem. 1910 Present location uncertain. 3m., 38 sp. st., tub. pn. Gt: 16.8.8.8.4.4.2-2/3.2. [Mixture prep. for].8.4. Sw: 16.8.8.8.8.8.4.2.Mixture.8.8.8.4. Ch: 8.8.8.4.4.2.8. Ped: 16.16.16.10-2/3.8.32.16. B. 1856 Gray & Davison, London; inst. T.V. Bridson. Present location uncertain. 2m., 15 sp.st., 2c., tr., Gt: 8.8 divided.8.4.2-2/3.2.III.8. Sw: 16.8.8.4.2.8. Ped: 16. St Saviour's Anglican Church, Redfern 1886. Building destroyed by fire 1882. B. c.1804 William Gray, London for unknown location in England. re-arrange Mixture III; Ch. Piccolo in place of 15th; Pedal Violoncello in place of Trombone). Inst. 1879 C.J. Jackson (purchased from England by Sir Daniel Cooper; cost £600). Des.1882. 3m., 26 sp. st., 4c., tr. Gt: 16.8.8.8.4.4.2-2/3.2.II.8. Sw: 16.8.8.4.II.8.8. Ch: 8.8.4.4.2.8. Ped: 16.16.8. 3m., 37 sp. st., 14c., el. pn. Gt: 16.8.8.8.8.8.4.4.2-2/3.2.8. Sw: 16.8.8.8.8.4.2.II.8.8.4. Ch: 8.8.8.8.4.2.8.8.8. Ped: 16.16.16.16.8.16.
dismantled Hill, Norman & Beard - parts sold to C.W. Leggo and S.T. Noad. 3m., 42 sp.st., 12c., tub. pn. Gt: 16.8.8.8.4.4.2-2/3.2.III.8.4. Sw: 16.8.8.8.4.4.2.III.8.8.4. Ch & Solo: 8.8.8.8.8.4.2.16.8.8.8.4. B. 1920 T.C. Edwards. Reb. 1969 Hill, Norman & Beard (electrification). Rem. 1970 to storage Pitchford & Garside. 2m., 10 sp. st., 4c., el. pn. Gt: 8.8.8.4. Sw: 8.8.8.8. Ped: 16.8. 2m., 7 sp.st., 2c. : tr. Gt: 8.8 divided.4. Sw: 8.8.4. Ped: 16. B. c. 1923 Wurlitzer Co., Tonawanda, N.Y.
Inst. 1937 from Wintergarden Theatre, Brisbane. in small original church Pitchford and Garside, but not erected. 2m., 7 sp. st., 3c., tr. B. 1920's Wurlitzer Co., Tonawanda, N.Y. 3m., 15 rks. ext., el.pn. B. 1874 Jackson 1m., 9 sp. st., mech. Sold to St Stephen's, Penrith 1906 where it was rebuilt and enlarged, Geo Fincham & Sons. opened at factory 8/7/1840 by Mr Mather opened in Cathedral 30/6/1841. 2m., 24 sp. st., 3c., 10 comp. pedals, tr.Case designed by A.W.N. Pugin. Gt: (to GG) 8 divided. 8.8.8.8.4.4.2-2/3.2.Sesqu.Mix.8.4.8 divided. Sw: (to G) 8.8.4.4.2.8. Ped: (to GGG) 32.16.8.16. Destroyed by fire 1865.
parts used in Sharp chancel organ, St Mark's Anglican Church, Figtree, and elsewhere. 2m., 26 sp. st., 3c., tr. Gt: 16.8.8.8.8.4.4.2-2/3.2.III.8.8. coxt £336.16/3. Rem. c. 1895. Present location unknown. 2m., 14 sp st., 2c., tr. Gt: (to GG) 8.8 divided.8.4.2-2/3.2.III.8. Sw: (ten. C) 8.8.4.2.8. Ped: 16. Second organ: B. c. 1895 Charles Anneesens, Grammont, Belgium. 3m., 28 sp.st., 7c., tub. pn. Gt: 16.16.8.8.4.2.IV.16.8.4. Sw: 16.8.8.8.8.4.2.16.8.8.8. Ch: 8.8.8. Ped: 16.16.16.8. Reb. 1971-72 A. Welby 2m., 29 sp.st., 7c., el.pn. Gt: 8.8.4.4.2-2/3.2.IV.IV.8. 2m., 14 sp. st., 3c., tr. Sold to St Paul's, Charters Towers, Queensland 1895. Not used since 1912. 2m., 15 sp.st., 3c., tr. & tub.pn. pedal action. Gt: 8.8.8.4.4.2.8. Sw: 8.8.8.8.4.8. Ped: 16.16. Hill, Norman & Beard 1929-30, 3m. 47 sp.st., 18c., el. pn. 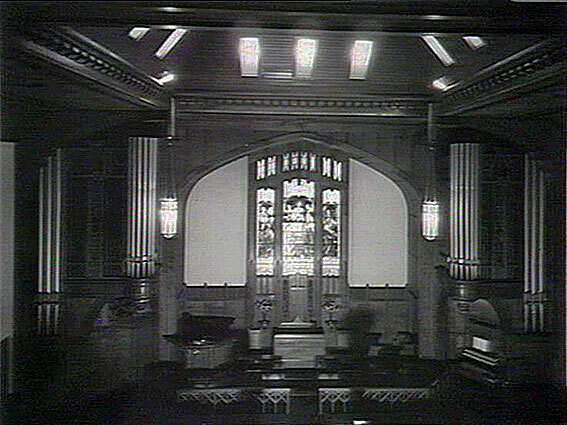 Organ removed from Assembly Hall with redevelopment of the church building (c.2000). South Island Organ Co. and Peter D G Jewkes (Sydney) 2004. 3m, 50 speaking stops, 18 couplers, el.pn. 2m, 18 speaking stops, 3 couplers, tub. pn. B. J.W. Walker, London; cost £399. B. 1921 J.E. Dodd, Adelaide; inst. 1925 from Methodist Church, Wallaroo Mines, SA. 2m., 18 sp. st., 5c., tub. pn. Gt: 8.8.8.4.4.2.8. Sw: 16.8.8.8.8.4.8.8. Ped: 16.16.16. Church closed 2002 and organ sold. Second organ: B. 1934 Hill, Norman & Beard (o/n N13). Reb. 1979 Pitchford & Garside. 2m., 6rks. ext., 8c., el.pn. Gt: 8.8.8.4.4.2-2/3.2. Sw: 8.8.8.4.4.2.1-1/3.8. Ped: 16.8.8.4.4. Church demolished to make way for new Wesley Mission 1991.